From left to right: Monica Tremblay, chair of the Decision Sciences and Information Systems at the College of Business, Arturo Castellanos and Longhui Zhang. 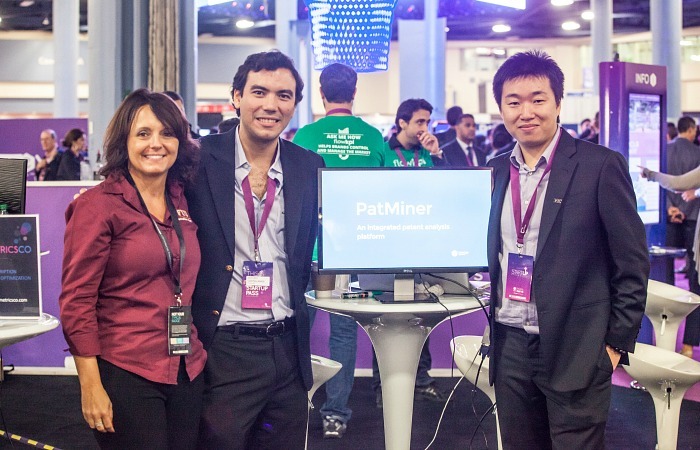 Start-up Pat Miner, consisting of FIU Ph.D. students Arturo Castellanos and Longhui Zhang, was one of only five innovative emerging companies from the Florida university system selected to participate in a pitch competition at eMerge Americas, a five-day technology conference currently being held on Miami Beach. Each company was given a few minutes on May 5 to convince the panel of judges from Miami Innovation Fund that they were deserving of a cash investment. Although they didn’t win the $25,000 investment by the renowned seed investor, for Castellanos and Zhang, the exposure was priceless. Pat Miner – a collaboration between Zhang, a doctoral candidate in computer science, and Castellanos, a doctoral candidate in information systems – focuses on data mining patents. With more than 19 million patents to be analyzed, Pat Miner is an integrated platform that assists clients in patent investigating, processing and analyzing, helping to reveal technical details, inspire novel solutions, support decision making and reduce human effort. In the competition, university track companies are pre-revenue companies that have their origin in the Florida University system; have team members that are students, professors and alumni; have a Minimum Viable Product; and are younger than one year. Congratulations on the achievements and best of luck with Pat Miner. Good to see familiar faces.